A loud noise coming from your kitchen faucet is likely to get your attention every time you turn on the water. This annoying sound is often accompanied by low water pressure. Even if you could live with the loud noise, living with the low water pressure isn’t a possibility. Luckily, the cause of the noise can be found by looking at a few things: the pipes, recent plumbing jobs or the faucet. 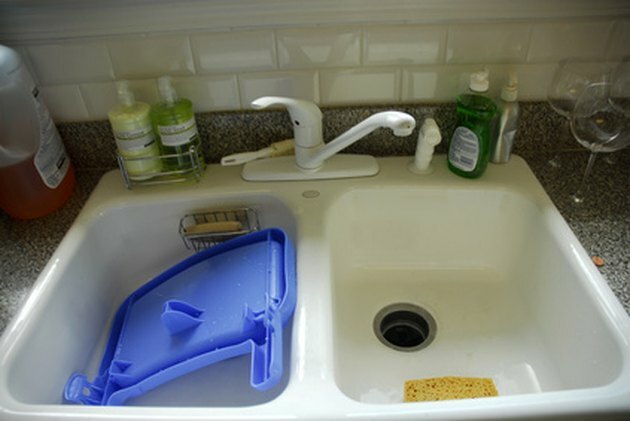 A noisy kitchen faucet is caused by only a few things. A kink in the pipe can cause noise. If the pipes under your sink are exposed, there’s a chance the pipes got knocked when you put something under the sink, which can cause a bend or kink. Check under the sink to see if the pipes are bent. Use a flashlight to look under where the pipe connects to the faucet. The kink can cause a bottleneck, which causes water pressure to build and create the sound. Pipes underneath the sink can bang together from water pressure. Generally, a piece of insulation will keep them apart. Check to see if a piece of insulation has fallen off. Check the pipes to make sure they haven’t come loose. Hot water expands the pipes when it comes into the house This affects the highest point in the plumbing; insulation will minimize this. If you have a faucet aerator that is not meant for high pressure, it can cause a loud noise when the water pressure coming into the house is set too high. Turn the water pressure down, or switch aerators to eliminate the sound. Some faucets come with a washer that restricts water flow for conservation reasons. This washer can cause a high-pitched, squealing sound but usually can be removed easily with pliers. Check with the manufacturer. The faucet also contains washers that can wear out. Replacing the washers may solve the problem. Hardware stores carry replacement washers. Most faucets last 15 to 20 years. Consider replacing the entire faucet if it's past its time. If you live in an area with high mineral content, sediment can build up in the water line. Over the years, the minerals create a blockage at the entrance to your faucet. The water is then forced into the faucet, which creates an annoying sound. You can remove the pipes connected to your faucet, and poke a nail or an ice pick gently into the opening of the pipe to remove any sediment buildup that comes out. Ki West has written since 1998. West writes for Roblox.info, a tutorial website focused on teaching Lua for Roblox.com. She has been published in “Tallahassee Homeschool” and “Get Well News.” A longtime advocate for natural healing, she teaches natural health at a local center. West graduated from Tennessee State University with a Bachelor of Science in journalism, minoring in health sciences. What Causes a Whistling Sound When I Turn on My Shower? What Causes a Water Faucet Squeal?